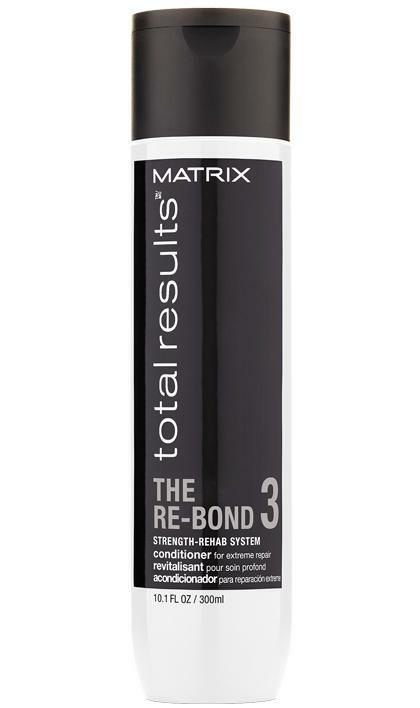 Share https://www.matrix.com/total-results/products/the-re-bond/the-re-bond-conditioner The Re-Bond Conditionerhttps://www.matrix.com/~/media/images/haircare/totalresults/the-re-bond/re-bond_conditioner_420x708.jpg Seals in moisture and protects hair from the inside-out. Seals in moisture and protects hair from the inside-out. Repair your hair after damage from 3 lightening services* with Total Results The Re-Bond system. The 3 step routine helps fortify weakened, over processed hair leaving it strengthened, revitalized and smooth. Total results Re-Bond Conditioner uses Taurine to seal in moisture and protect your every strand from the inside-out, creating more resilance against future damange. Use as a system of Shampoo, Pre-Conditioner and Conditioner for maximum results.